WRGB, virtual and VHF digital channel 6, is a CBS-affiliated television station licensed to Schenectady, New York, United States and serving New York's Capital District (Albany–Schenectady–Troy) as well as Berkshire County, Massachusetts. Owned by the Sinclair Broadcast Group, WRGB is part of a duopoly with CW affiliate WCWN (channel 45) and the two stations share studios on Balltown Road in Niskayuna, New York (with a Schenectady postal address). WRGB's transmitter is located on the Helderberg Escarpment west of New Salem, a hamlet of New Scotland. WCWN additionally carries a simulcast of WRGB's main channel in 720p high definition on subchannel 45.3 for the convenience of UHF viewers who have trouble receiving WRGB's VHF signal. WRGB is most notable for being among the first experimental television stations in the world. It began with test broadcasts in early 1928. Later that year the first daily programs were broadcast. It later became one of a handful of television stations licensed for commercial broadcasting operation before the end of World War II. The station launched the on-camera careers of TV chefs Art "Mr. Food" Ginsburg in the mid-1970s; and of Rachael Ray, who launched her "30 Minute Meals" segment on WRGB's newscasts in the mid-1990s. 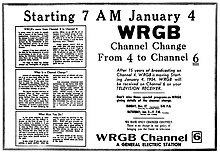 One of the first television stations in the world, WRGB traces its roots to an experimental station founded on January 13, 1928 broadcast from the General Electric facility in Schenectady under the call letters W2XB. It was popularly known as "WGY Television" after its sister radio station (though WMAK, the predecessor of modern station WBEN in Buffalo also had partial control of the station, which was relinquished shortly after the station signed on). In 1940, it began sharing programs with W2XBS (forerunner of WNBC) in New York City receiving the New York station directly off the air from a mountaintop and rebroadcasting the signal, becoming NBC's first television affiliate. Later, the New York connection was achieved via coaxial cable and eventually by satellite. The NBC affiliation would last for 42 years. The station initially broadcast on 790 kHz from a 380-meter antenna. The station also broadcast on the frequency of 379.5 kHz, with 24 vertical lines of resolution and 21 frames per second. Its call-sign was changed to W2XAD rather quickly in 1928 and moved to 31.4 MHz. Towards December 1928, the station would receive yet another change and upgrade with its call letters becoming W2XAF, keeping its frequency, frame rate and vertical lines. Later on, the station received a further upgrade to broadcast 48 lines at 20 frames per second, with the call sign of W2XB on 2.1-2.2 MHz. Late in the 1930s it moved into the VHF band using a 6 MHz-wide channel band and increasing visual resolution (gradually increasing from 343 to 441 to 525 lines). In 1941, the station moved into a state-of-the-art studio on Washington Avenue in Schenectady. It was the first building in the nation specifically designed for television. On February 26, 1942, W2XB received a commercial license as WRGB, the fourth in the nation and only the second one outside of New York City. Although GE could have selected the call letters WGY-TV to match its radio sister, it opted to name its new station in honor of Walter Ransom Gail Baker, a GE vice president and the cofounder of the NTSC. By then, it was operating on the VHF band with modern 525-line resolution and FM sound on a frequency of 66 to 72 MHz (then known as Channel 3, but redesignated Channel 4 after the Second World War). In 1948, WRGB took on secondary affiliations with the three other networks in operation (CBS, ABC, and DuMont). At the time of the announcement, the station only broadcast for 28 hours a week. On January 4, 1954, it moved from channel 4 to channel 6 to alleviate interference from WNBC-TV (then known as WRCA-TV) and Boston's WBZ-TV, and increased its radiated power approximately fourfold to 93,000 watts. WRGB dropped its secondary affiliations when WCDA (channel 41, now WTEN on channel 10) and WTRI (channel 35, now WNYT on channel 13) took the ABC and CBS affiliations respectively. From 1939 till 1957, the station's studio were located on Washington Avenue in downtown Schenectady. In 1957, WRGB moved to its current studio on Balltown Road on the line between Niskayuna and Schenectady; the old studio is currently occupied by Schenectady County Community College. The longest-running locally produced children's television show, Freihofer's Breadtime Stories was broadcast on the station starting November 21, 1949. WRGB produced two of the longest-running locally produced programs in television history: a quiz show called Answers Please and a bowling program entitled TV Tournament Time. After the cancellation of both by the late-1980s, WRGB's local programming has been variable and erratic, ranging from a local home shopping show to a weekly video countdown done with Top 40 stations WFLY and (later) WKKF. On September 28, 1981, WRGB swapped affiliations with WAST (now WNYT) and became a CBS affiliate. WAST had only picked up the CBS affiliation four years earlier, but had remained stubbornly in third place behind WRGB and WTEN. Under the circumstances, when its affiliation contract with WAST ran out, CBS jumped at the chance to align with long-dominant WRGB. The switch made WRGB the third station in the Capital District to affiliate with CBS. The network had originally aired on WTRI, forerunner of WNYT, from 1954 to 1955, then moved to WCDA (now WTEN) from 1955 to 1977. In April 1983, 55 years of General Electric ownership ended when it sold WRGB to Universal Communications Corporation which was owned by Forstmann Little and John D. Backe, a former CBS president and then president of Tomorrow Entertainment (GE would re-enter the TV business upon its purchase of RCA, then-parent company of NBC in late 1985, which WRGB was formerly affiliated with). WRGB was sold to Freedom Communications in March 1986. In 1987, WRGB was awarded the "Broadcast Pioneers Golden Mike Award" and shortly thereafter was awarded a "Presidential Citation" by Ronald Reagan. WRGB changed its on-air name to "CBS 6" in October 2004 after decades of being known as either "TV 6" or "Channel 6," while its news operation became CBS 6 News. Since then, channel 6 has almost never used its call letters on-air, except during legal identifications and its time and temperature bug. WRGB is carried on cable as far north as Long Lake, New York as well as several other Adirondack regional cable systems. In September 2003, WRGB-DT (UHF channel 39) became the first full-market digital signal to sign on in the Albany region. Around December 2007, WRGB and WCWN became the first television stations in the Capital District that upgraded to high definition time delay and rebroadcast capability, and high definition local broadcasts. This allows broadcasting of syndicated shows in high definition. Providence Equity Partners owns a controlling stake in Newport Television (formerly Clear Channel Communications' television division), the owner of local Fox affiliate WXXA (channel 23). As a result, the Federal Communications Commission (FCC) granted conditional approval of Newport's acquisition of Clear Channel Television in late November 2007, provided that Providence Equity Partners would follow through with its planned divestiture of its 16 percent share of Freedom Communications to another company (as required when Providence Equity Partners purchased a minority stake in the Spanish-language broadcaster Univision earlier in 2007) as soon as the deal was finalized. Freedom filed for Chapter 11 bankruptcy in September 2009, emerging in April 2010. At that point, Providence Equity Partners relinquished its stake in Freedom Communications, making its purchase of WXXA legitimate. Freedom announced on November 2, 2011 that it would bow out of television and sell its stations, including WRGB, to Sinclair Broadcast Group. The group deal closed on April 2, 2012 after which Sinclair obtained a waiver allowing the company to keep both WRGB and WCWN. WRGB's former analog TV signal used an FM audio carrier which could be heard on 87.75 FM in areas where the video signal could be received (and some where it could not); the same was true of all analog channel 6 television stations in North America. However, this analog FM carrier no longer exists for full-powered stations after the June 12, 2009, conversion to digital, but still exists for analog low-power broadcasting#Television stations (see Pulse 87 for an example). As WRGB has returned to channel 6, it has proposed an unconventional approach, by which it has requested to operate an analog FM radio transmitter at one edge of its digital TV allocation, using vertical polarization to retain compatibility with standard broadcast car radio receivers. According to WRGB's site, "We hope that the FCC will allow us to continue to operate on 87.7. We are building a unique transmitter for 87.7 that can operate simultaneously with our DTV signal on channel 6. TV transmissions always use horizontal antennas. Our new 87.7 transmitter will be vertically polarized. The use of vertical polarization for 87.7 will allow reception of our audio in a car radio or any other FM radio with a whip type antenna. " WRGB is the only full-power station to propose such a solution. There are no other full-power TV broadcasters using channel 6 in New York state, either analog or digital. WPVI-TV in Philadelphia, the nearest full-power channel 6, has expressed an interest in the technology, though it is concerned about rights issues. The station received an experimental special temporary authorization from the FCC to allow it to test the FM audio system but it had to cease operations when it was found to cause RF interference with the digital TV signal. On July 7, 2009, WRGB resumed its radio simulcast broadcasts on a frequency of 87.9 FM, without explicit FCC authorization. Less than two months later, on August 24, the FCC ordered WRGB to turn off the 87.9 transmitter. Currently, the only two stations licensed by the FCC to use 87.9 are KSFH, a high school station in Mountain View, California; and K200AA, a CSN International repeater in Sun Valley, Nevada. WITI, another former analog Channel 6 in Milwaukee, Wisconsin, restored its radio audio via a content agreement with Clear Channel Communications, which placed that station's audio on the HD Radio subchannel of WMIL-FM, and it is possible WRGB could consider this venue to restore the service. As noted above, on June 12, 2009, WRGB became a digital-only station. The station vacated its digital transition UHF Channel 39 and moved its digital operations to their former analog channel assignment on VHF-low channel 6. After the digital transition, some viewers in the Capital District had receptions issues with the WRGB signal. So WRGB boosted their power twice: Once in July 2009 at the power level of 11.5 kW with an interference agreement with WPVI-TV in Philadelphia and WEDY in New Haven, Connecticut. And in late January 2010, the FCC granted an STA for WRGB to boost their power again at their current level of 30.2 kW. An application was filed back in June 2009 to operate at the current level on a permanent basis. That application was granted on March 16, 2011. WRGB has also filed applications for three digital replacement translators to fill in some of the coverage-loss areas, which have all been granted construction permits. One will be in Schenectady on the station's pre-transition digital allotment on UHF Channel 39, another one will be in Kingston on UHF Channel 24, and the last one will be in Pittsfield on UHF Channel 19. The Kingston translator became operational in May 2011. Upon the purchase of WCWN, Sinclair added a simulcast of WRGB's main signal in a reduced 720p form on WCWN-DT3, allowing viewers with no access to the main WRGB VHF signal in the core of the Capital Region to utilize WCWN's UHF signal for reception of WRGB programming. In April 2003, WRGB signed a joint sales agreement with the area's fledgling UPN affiliate WNYA several months prior to that station's sign-on in September. Under the agreement, WRGB handled advertising sales for WNYA and shared syndicated programming with the station. The agreement, originally set to expire at the end of August 2006, was extended to the end of 2008, but was terminated in February 2007. Since September 5, 2006, WNYA has been the area's MyNetworkTV affiliate. During past airings of the annual Jerry Lewis MDA Telethon, WNYA took on the responsibility of airing WRGB's local and network lineup. This role was later shifted to WCWN, which also aired CBS' coverage of the US Open Tennis Championship. This was no longer necessary starting with Jerry Lewis' retirement as telethon host and MDA chairman in 2011, as the telethon was significantly shortened to six hours on the night before Labor Day that year. Starting in 2013, WTEN broadcast the shortened telethon, retitled the MDA Show of Strength, as it moved to ABC from syndication for the telethon's remaining two years, ending after the 2014 edition. WRGB shut down its analog signal, over VHF channel 6, on June 12, 2009, the official date in which full-power television stations in the United States transitioned from analog to digital broadcasts under federal mandate. The station's digital signal relocated from its pre-transition UHF channel 39 to VHF channel 6. For most of its first half-century on the air, WRGB was the dominant news station in the Capital District. This was in part because of its status as the area's first station. Indeed, for its first decade-and-a-half on the air as a commercial station, it was the only station that provided a clear picture to most of the market; its competitors were initially on the UHF band before the FCC dropped in additional VHF allocations in the late 1950s. It also benefited from its relationship with WGY radio, which was a sister station from 1942 to 1983; the two stations were able to cover the Capital District like no one else could. Its newscasts were anchored for over 40 years by the venerable Ernie Tetrault (who was immortalized in the 1992 film Sneakers directed by one-time WRGB intern Phil Alden Robinson). Liz Bishop is the station's longest tenured personality. She joined WRGB as a weekend sportscaster in 1975, and became Tetrault's last anchor desk partner in 1982. She is still the station's main female anchor. After Tetrault's retirement in 1993, the station was quickly eclipsed by WNYT and for several years in the mid-1990s fell to third place, mirroring a nationwide trend that saw CBS' ratings drop in the wake of losing rights to the National Football League while NBC was buoyed by blockbuster shows like Seinfeld and ER, along with NBA and Olympics coverage. For the most part, the station has stabilized at a steady second place although for a period in the early-2000s it fell back to third. In recent years, the Capital District has seen a spirited three-way battle for news leadership, with WRGB, WTEN, and WNYT regularly trading the number-one spot. From April 2003 until mid-2004, WNYA aired replays of WRGB's weekday noon show at 1, weeknight 11 o'clock news at 11:35, and WRGB's former public affairs program Sunday Morning with Liz Bishop. On April 17, 2006, it was announced that WNYA would begin airing an hour long extension of WRGB's weekday morning newscast at 7 known (at the time) as CBS 6 First News on UPN Capital Region. This could be seen as a pre-emptive move by WRGB to fend off a challenge by WXXA who had announced their plans to launch weekday morning news two weeks earlier. Rumors of WRGB producing a 10 p.m. broadcast on WNYA had circulated as well. However, the pickup of a second run of Dr. Phil to air at that hour killed the rumors. At the start of 2007, the news on WNYA moved to WCWN (because that station had higher ratings overall) becoming CBS 6 First News on The Capital Region's CW. In 2007 and 2008, WCWN aired WRGB's 11 o'clock news during CBS' coverage of NCAA March Madness. On January 13, 2008, WRGB began producing its newscasts in high definition, becoming the first in the market to do so. This was exactly 80 years to the date after its first experimental broadcasts. The WCWN broadcast was upgraded the next day. After becoming a sister station, it was rumored that WCWN would add a WRGB-produced 10 p.m. broadcast to challenge WXXA's long time dominance at that hour. This became a reality on September 24 when WRGB launched a weeknight 10-minute block in high definition featuring the top stories of the day along with an updated weather forecast. Accordingly, it was known as The CBS 6 News 10 at 10. The success of the 10-minute newscast resulted in the expansion to a full 30 minute newscast in October 2010, currently anchored by Dori Marlin and Jerry Gretzinger. WRGB delays the weeknight broadcast of the CBS Evening News until 7 in favor of an extra half hour of local news. In addition to their main studios, it operates an Albany Bureau at One Commerce Plaza in downtown Albany. As with its heritage of being the first station in the Capital Region, WRGB has also had several firsts in the weather field, given the unpredictable weather of the Northeast. In February 1996, it became the first Capital District station to put forecasts on the World Wide Web with the launch of a website. A severe weather outbreak in late May 1998 led to further developments in the station's weather coverage. WRGB won an Emmy Award for Chief Meteorologist Steve Lapointe's near-nonstop work over two days which made sure there were no fatalities in the otherwise devastating weather. In May 1999, the station started "WeatherNet 6" which allows viewers to submit weather observations around the area. The public is allowed to report anything from current conditions to snowfall totals. In 2000, the station became the first in the market to offer a station-owned weather radar known as "Instant Doppler 6" that was installed next to their studios. This exclusive distinction was held until 2004 when WNYT set up its own live radar. In recent times, WTEN and WXXA have also updated their radar outputs to so-called "live" capabilities. They do not own their own radars but decided to re-brand the live NOAA National Weather Service NEXRAD Level II radar data as their own. Data is used from four regional sites in Albany, Binghamton, Montague, and Upton. This government data is also used on WRGB known as "WeatherScan Radar". WRGB was the last in the market to bring a degree-holding meteorologist onto its staff with the purchase of the station by Freedom, not doing so until several years after WTEN and WNYT did. On January 6, 2009, veteran meteorologist Neal Estano returned to the area airwaves for his third tour of duty with WRGB. He had worked for the station twice before leaving to pursue new opportunities in Jacksonville, Florida and Baltimore, Maryland. Estano left the station on April 25, 2012, taking on a new career in real estate with Keller Williams Realty. Estano has since reappeared on Capital Region airwaves, starting at WNYT in the summer of 2013 on weekend evenings. Joe Pagliarulo (Main anchor) is an American, nationally syndicated conservative TV/radio talk show host. ^ "WRGB to Get ABC, CBS, DuMont Shows, Plus NBC" (PDF). Broadcasting - Telecasting. October 11, 1948. p. 34. ^ "'Breadtime Stories' Head Into 15th Year". Schenectady Gazette. November 18, 1964. p. 16 (col 2). ^ Cuff, Daniel F. (April 27, 1983). "BUSINESS PEOPLE; Ex-CBS President Buys Upstate TV Station". New York Times. Retrieved August 31, 2016. ^ "FCC OK's Clear Channel TV Sale". Broadcasting & Cable. Retrieved 2007-11-29. ^ "CBS 6 is back on the radio -- this time on 87.9 FM!". ^ "Regarding CBS 6 radio simulcast on 87.9 FM". ^ a b "CDBS Print". Licensing.fcc.gov. Retrieved 2013-04-22. ^ "CDBS Print". Licensing.fcc.gov. Retrieved 2013-04-22. ^ a b c "CDBS Print". Licensing.fcc.gov. Retrieved 2013-04-22. ^ Churchill, Chris (2010-10-16). "More news is the latest news". Times Union. Retrieved 2013-04-22. ^ "WRGB's Estano latest to switch from media to real estate - The Business Review". Bizjournals.com. 2012-04-19. Retrieved 2013-04-22.